1. Have a Pool Party! Get the entire gang together for the ultimate pool party in our spectacular indoor swimming pool! Many think of pool parties as a summer activity, but our indoor pool is maintained at 81 degrees throughout the year. Therefore, you can take a dip regardless of the weather! Your group will also the ambiance of the pool area as it features a huge fireplace that rises to the top of the pool building. 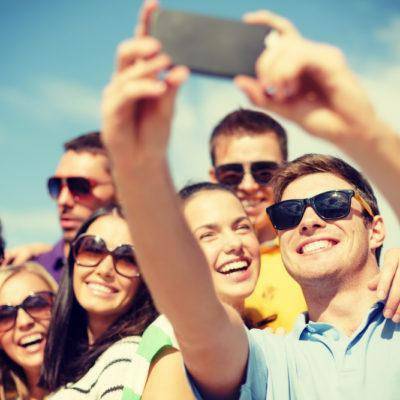 Moose Hollow Lodge has provided all the things you need for your exciting pool party, including picnic tables and grills just outside on the covered porch! 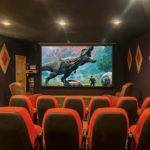 Our large cabin in Pigeon Forge TN allows you to bring the thrill of the movies home with our state of the art theater. Bring along your favorite movies and get ready to take your viewing experience to new heights! In addition to surround sound and a massive viewing screen, we feature the only rumble seat theater in Pigeon Forge that allows you to FEEL the movies! With 22 comfortable seats and soundproof walls, you’ll truly feel like you have been transported into the movie. Grab the popcorn and settle in for an exciting movie night at the Moose Hollow Lodge! 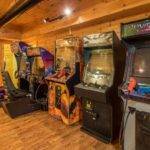 For another great thing to do in our amazing lodge, check out our game room with a variety of exciting options! Challenge your friends to a game of billiards on our pool table or create a tournament playing on our air hockey table. For the video game fans in your group, the game room features a full arcade with classics such as Ms. Pac Man, Galaga, Cruisin’ Exotica and more! While other guests are waiting their turn to play, they can enjoy the game room’s two cable televisions with access to hundreds of channels. scenery of the Great Smoky Mountains… pure heaven on earth! 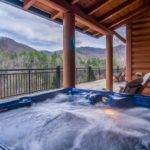 This is a great place to soak sore muscles after a busy day of sightseeing in Pigeon Forge or to socialize with your group while unwinding under the stars. The early risers in your group will love a morning soak while watching the sunrise! 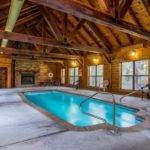 With so many incredible things to do at the Moose Hollow Lodge, your group may never want to leave our spectacular cabin! 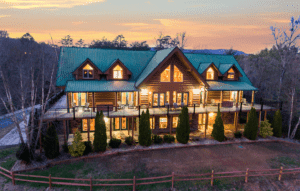 Take a tour of our large cabin in Pigeon Forge TN and we look forward to hosting your group in the Smoky Mountains! We hosted our wedding at the moose hollow lodge and it was perfect for us and our friends and family. Sleeping accommodations for 45 and reception space is wonderful! Couldn’t have picked a better place. Ed is great to work with!